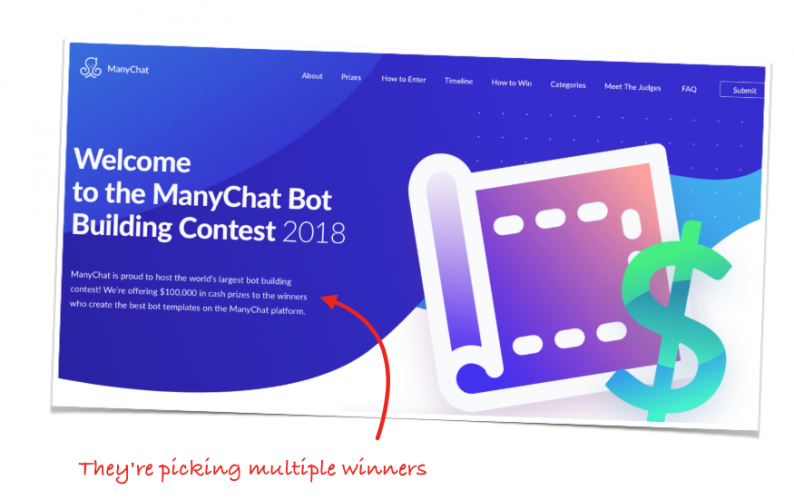 ManyChat is running a chatbot template contest. And they asked me to be a judge because I’ve seen a LOT of chatbot templates. I think you should enter the contest. But even if you don’t, I strongly recommend you start thinking of every single bot you create as a template that you’ll use to create future bots. Because once you do the work of creating one chatbot, it’s so easy to duplicate that work for other clients. The truth is, no. Probably not. A chiropractor in New York doesn’t care if you build a similar bot for a chiropractor in Chicago. They aren’t competitors. Also, a template is just a starting point. You’ll customize it for each client, tweaking it and improving it as you go. So it’s not a copy/paste job. However, a template WILL save you a lot of unnecessary work. And shouldn’t you build on your expertise…instead of starting from scratch every time? Plus, since you’ll continually improve your templates, your clients will get much more profitable bots. So if you’re a bot builder, or you’re thinking about becoming one, create templates. And if you want to be chat-world-famous, enter the ManyChat contest. Hope to see your chatbot on the winner’s list. Want Bot Academy to train you to land clients? Bot Academy is the leading chatbot training company. Use this to get our free training.